A Lovely Lark: Kitchen is "Finished"!!! love it! I've been too scared to tackle mine. Yours looks great, Lauren! It's beautiful! 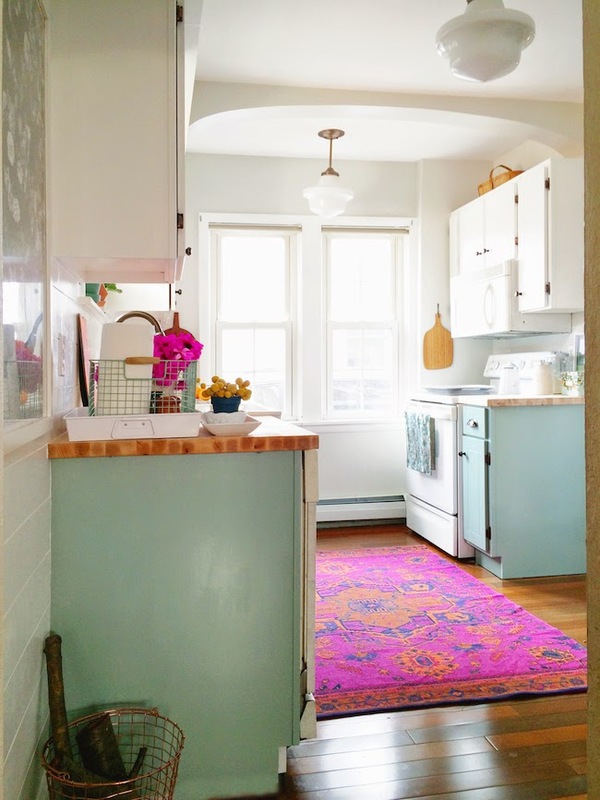 I love the color you chose for the lower cabinets, and the colorful pink rug! Love it! 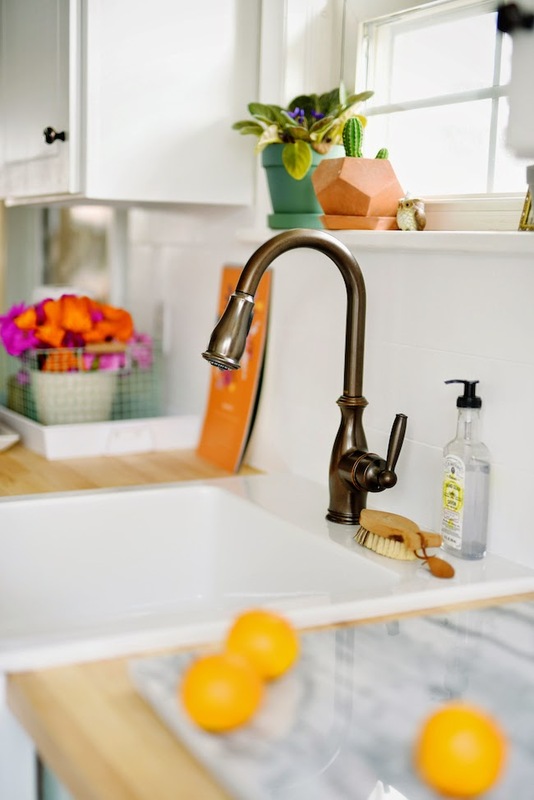 What did you use for the plank backsplash? Did you buy pre-cut boards or did you do that yourself? This is THE most adorable kitchen I have seen in a long time. Such a great job! Found you over at AT. Cabinet colour = perfect!! Lovely kitchen! I never thought to paint the lower cabinets a differenct color other than white. Genius! 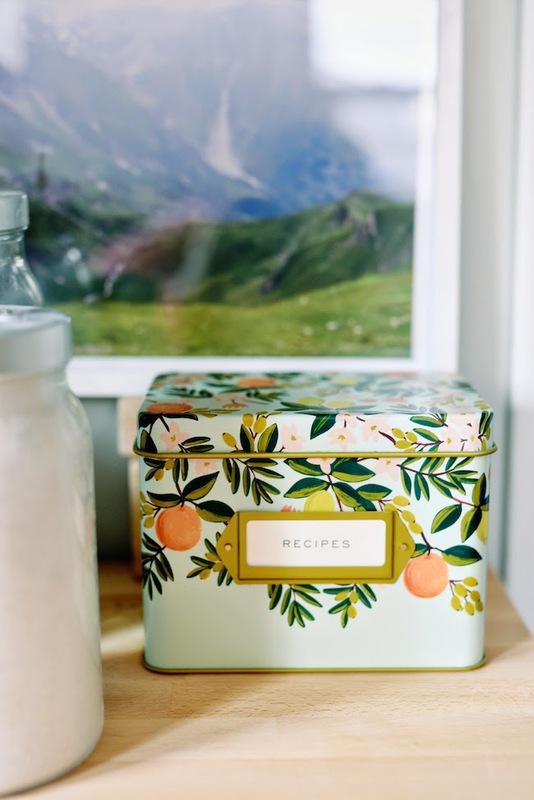 May I ask where the mountain print (behind the floral recipe box) is from? It's very serene and lovely. It's actually a photograph that I took on my honeymoon! Darn! I guess I'll just have to travel and take my own picture. ha. Thanks for the reply. Wow, wow, WOW! I came here from the AT site and I have to say, I could just LIVE in this beautiful and happy kitchen! "Real people" projects on a budget are so inspirational; thank you so much for sharing! And now to order that rug for our daughter's (soon to be daughter and son's) room. I can't wait to check out the rest of your blog! Congratulations on a job beautifully done!! Really really beautiful, Lauren! You did such an amazing job. I love all the color and how fresh everything looks. Makes me want to repaint my cabinets!! Love it! Where did you find the marble and wood cake stand? Yes the kilim really makes the space, doesn't it?! This is my dream kitchen! Definitely saving ideas from this for my future home! Thanks for sharing. It's so beautiful! This is perfection! I really love the color palette and all the small details you've added in to the space. What color of paint did you use on your walls? 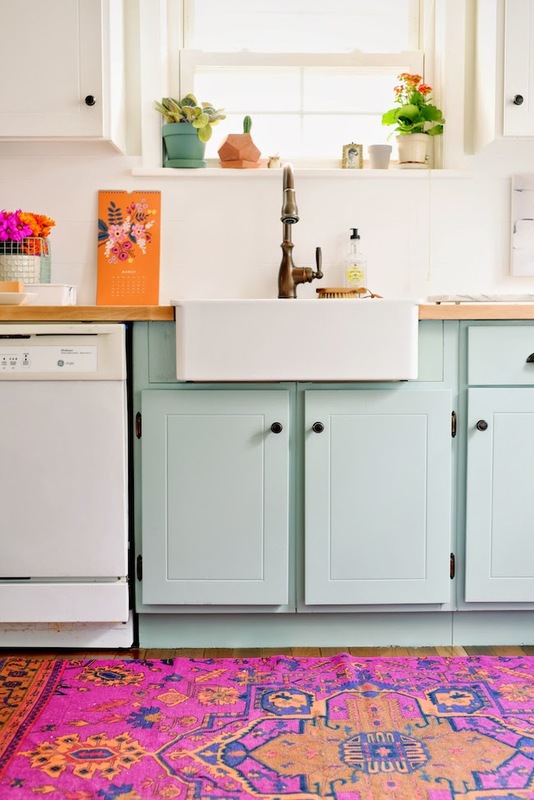 Also, how did you install the farmhouse sink into your pre-existing cabinets? Was there a farmhouse sink there before or did you cut into the cabinets to create a space for it? Thanks Marisa! The wall colors are Behr's Ultra Pure White and Silver Drop, and as for the farmhouse sink, my husband and father-in-law cut into our pre-existing cabinet and added some support to it. Hope that helps! What a sweet little cottage kitchen. So cute! Beautiful kitchen! Thanks for including your source list! I admired that rug weeks ago, and was so excited to see it was at UO! Soooo perfect!!! Do you remember what color wood you picked for the ikea wood countertops?! Love your kitchen! And we especially loved the pendant lights and ended up buying them for our kitchen update -- but I'm second guessing the size. Looks great in your pictures, I just wanted to make sure you purchased the 12.75 x 12 size and not the mini size which is 8 x 9. Our kitchen seems to be a similar size based on your pictures. Thanks! Love this Kitchen! Love all the charm! What is the name of the color you used on the lower cabinets? It's gorgeous. The color of the lower cabinets almost looks like a "robin's egg" color. Is it that blue in real life? The swatch looks totally gray online! I love the color in your photos, and would use it if it does have that hint of blue/green. Just wondering if it is just my monitor that makes it look bluish! It's pretty close to how it looks in real life - definitely has blue/green in it.